The Ministry of Foreign Affairs is mandated to pursue Kenya’s foreign policy in accordance with the constitution of Kenya, with the overarching objective of protecting, promoting and projecting the nation’s interest abroad. To project, promote and protect Kenya’s interests and image globally through innovative diplomacy, and contribute towards a just, peaceful and equitable world. To strengthen policy, legal and institutional capacity. Customer focus: We shall treat our customers with courtesy, respect and promptness. Patriotism: Our staff shall exercise loyalty and uphold allegiance to the Republic of Kenya at all times. 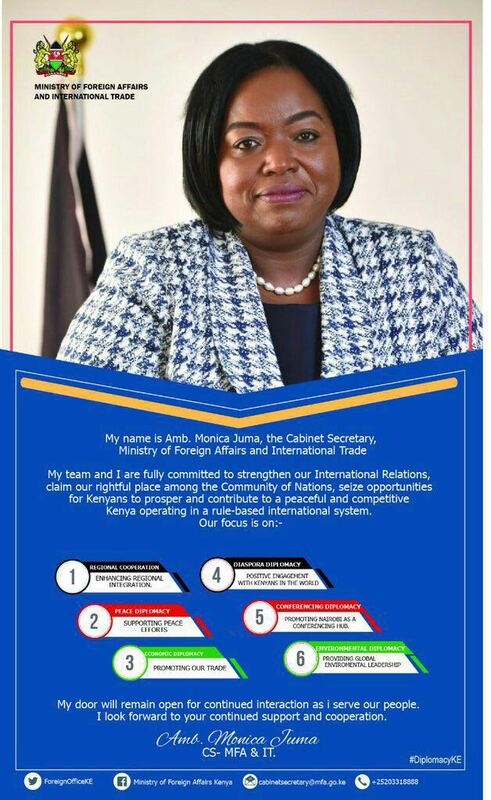 Team spirit: We shall promote teamwork to enhance service delivery. The Ministry will further inculcate a sense of shared and collective responsibility for the execution of its mandate. Professionalism: Our members of staff shall exercise high level of professional competence and confidentiality in all their work. Ethics and Integrity: We will embrace transparency and accountability in all operations of the Ministry. Equity and fairness: We shall promote justice, impartiality and diversity in all our dealings.